PROVIDES PRIVACY -Privacy Level: ★★★★☆. Instantly increases the privacy of your home & office. Best for any room in your home window- bed room, guest room, kid room, bathroom, RV. Great gift for women and mother’s day. EASY APPLICATION -Watch the YouTube video in our instructions, it can help you stick will on the window. Package include: one roll window film and one installation, film size: 35.4in. x 78.7in. Apply the film to your window in just a few short minutes with the use of a small squeegee. ADHESIVE-FREE -Requires absolutely no adhesive, so you can rest assured knowing the film will never damage your windows or leave behind a sticky residue. Constructed out of a premium vinyl material which has been designed to withstand heat and steam for long lasting quality. AFFORDABLE -An inexpensive alternative to those costly frosted windowpanes and walk-in shower doors. It can be reused about 3-5 times, you can take it away when you move house, Just peel off from corner. EASY APPLICATION: Apply the frosted glass film to your window in just a few short minutes with the use of a small squeegee. 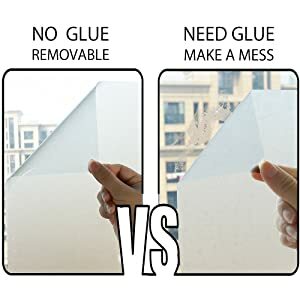 ADHESIVE-FREE: Requires absolutely no adhesive, so you can rest assured knowing the film will never damage your windows or leave behind a sticky residue. DURABLE: Constructed out of a premium vinyl material which has been designed to withstand heat and steam for long lasting quality. AFFORDABLE: An inexpensive alternative to those costly frosted windowpanes and walk-in shower doors. Get rid of peeking eyes! 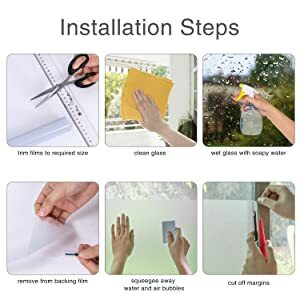 Totally protect your personal privacy, once fancy-fix privacy window film is applied, only a blurred shadow to show there is someone is using bathroom, avoid embarrassment. Block home life with outside! Protect your privacy but let light in. No annoying neighbor with curious eyes, keep mess view outside away from your mind, dogs or cats won't frighten by strange movement from outdoor. 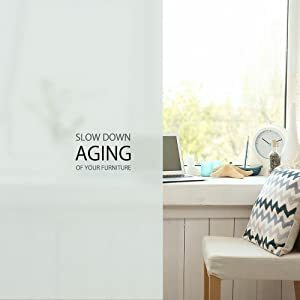 Slow down aging of your furniture! 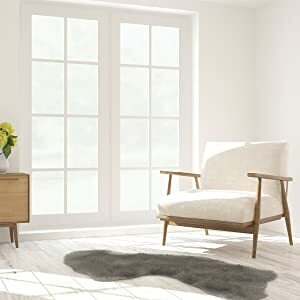 Reduce at least 85% ultraviolate ray through, keep furniture from fading. Also reduce 70% infrared ray through, save the cost of energy for warming or cooling. Why fancy-fix non-adhesive window film? Easy to stick on with water, no glue needed. Easy to remove, just peel it off, no sticky residue left. Once it was removed, can be reused like a new one. Quick Tips: Step 01. Clean glass Step 02.Wet glass with soapy water(or just clear water also work well) Step 03. Remove from backing protect sheet (which is a kind of clear vinyl, please MAKE SURE remove it before you apply the window film to glass) Step 04. Apply to wet glass and smooth with hands Step 05. Squeegee away water and air bubbles. 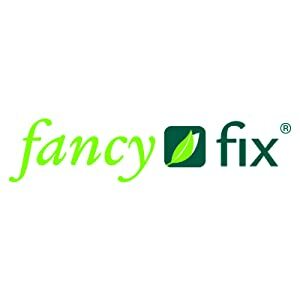 About fancy-fix Fancy-fix team has been in printing production line for more than 20 years. We perseveres with its unchanged idea since the first day of its birth, devoting our life to developing self-adhesive & adhesive free products in homing trend.